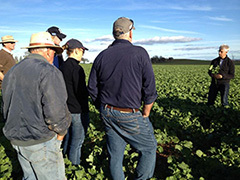 On the 11 June 2014, interested landholders gathered at John and Nicole Hopkins’ property “Allowah” to hear the latest news on pasture and cropping from the experts. Local agronomist Phil Bowden was on hand to discuss relevant issues and management of a range of crop including Wedgetail winter wheat and 45Y82 grazing canola. Phil discussed pest and disease management, and looked at potential for grazing and associated animal health issues. Phil Graham, NSW DPI, livestock technical specialist, discussed seasonal livestock issues and in conjunction with Local Land Service officer, Janelle Jenkins, looked at the advantages, establishment and issues associated with drought lots which are currently being funded through the LLS. A twelve month old mixed pasture of phalaris, grazing brome and clovers was also examined with discussion centred around the use of alternative legume species such as serradella in the local area.